Update! Yo, go check out the actual event! Craft Beer and Whiskey in one festival? Yes, Please! 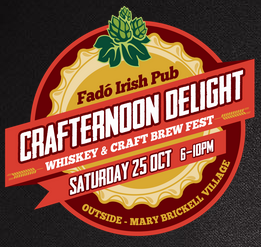 Of course I'm talking about the CrafterNoon Delight Whiskey & Craft Brew Fest taking place this Saturday, October 25, 2014 from 6 - 10 pm at Mary Brickell Village in Miami. Fado Irish Pub and Zevents have teamed up to create this boutique festival featuring over 15 craft brewers and 5 of the largest Whiskey and Scotch producers. Mary Brickell Village is located at 900 South Miami Ave, Miami, FL 33131. You can find a 40% off promotional code through Instagram @ZeventsMiami as well. Hope to see you there! I can personally already taste the Bulleit Bourbon and GABF Gold Winning Pops Porter from Wynwood Brewing! Update 10222014: Here's a LIMITED deal I was just emailed from your friends at Grovetoberfest! Use Code GFEST25 to get the $65 ticket for $25. Use Code GFEST35 to get the $85 ticket for $35.